Paul Reeve and I started discussing and planning this project in late January this year (2005) as a possible game to put on at our local show (Phalanx at St Helens) in September. It was one of a number of ideas we were tossing around and neither of us can remember why it came up or what attracted us to it. Neither of us are into Colonials and we don't have any 6mm armies (well not painted ones anyway) so maybe it was the novelty. 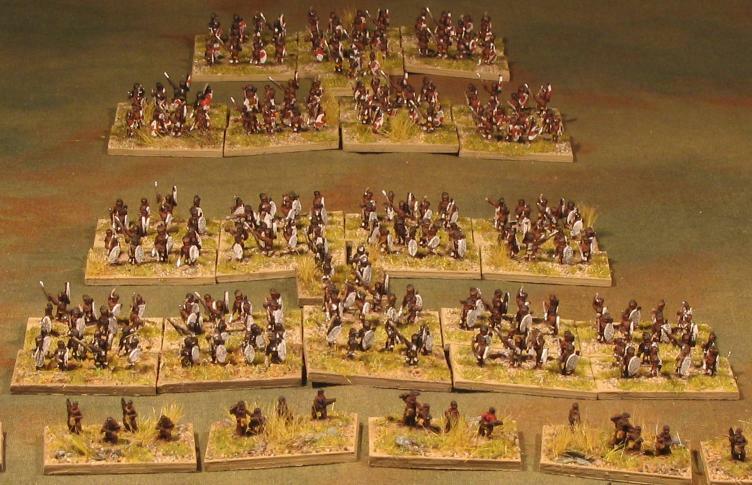 Anyway these are the first few units we have painted up with a few more to add soon (More Light Horse, Artillery, Naval detachment and more transport) and some more on order (more mounted Infantry, more Zulus and some Natal Native Contingent). The vast majority of the figures are from Heroics and Ros but there are a few Baccus and Irregular too. You really don't have much choice in this period as H&R do the only Colonial range as far as I know (No longer true - Baccus now do an excellent range). Each foot or cavalry base of 5 figures represents about 20 men. So 6 bases to an infantry company with its own command and 3 bases to a cavalry troop. 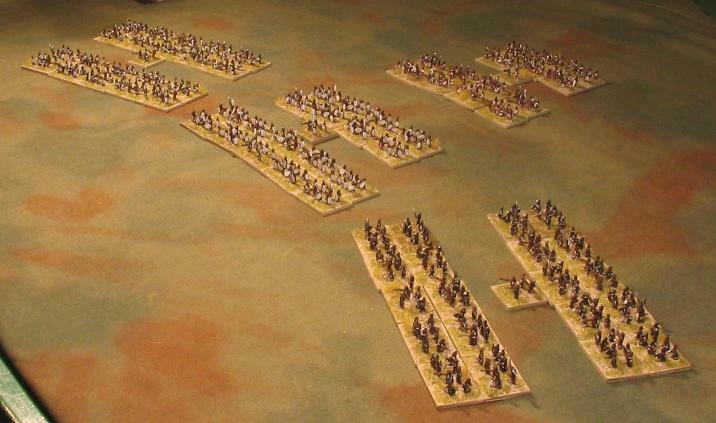 Light horse and Mounted Infantry have 4 mounted figures per base with dismounted bases as infantry. I have 2 mounted bases being replaced by a single foot base and a base of 4 horses with holder. Mounted bases represent about 15 horsemen. Above : All 4 companies of the 24th Foot with company commands and the Battalion command with the colours.  Below : The 24th in square with RA Gatlings at the angles. 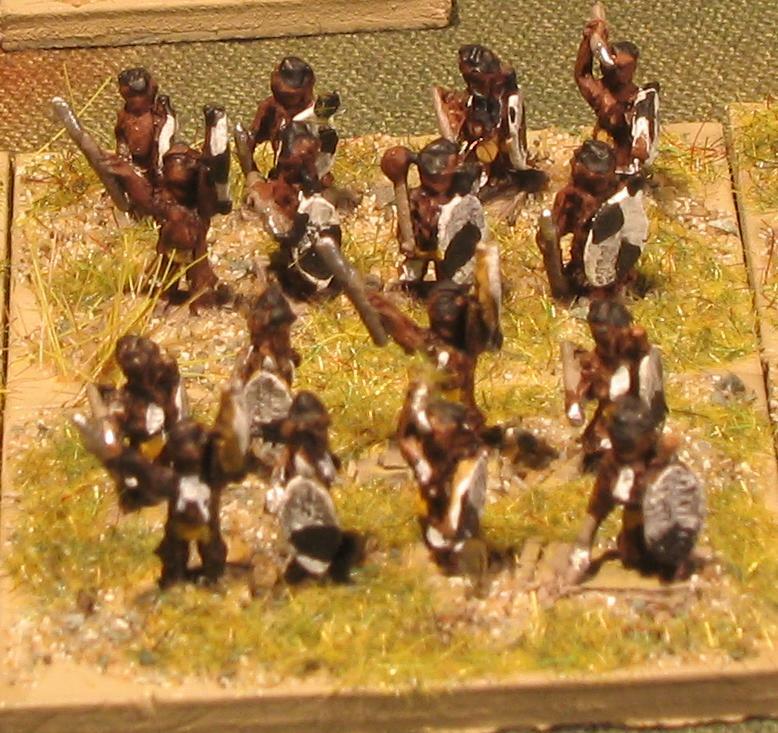 These are mostly the H&R Colonial British Skirmishers but with a few FPW Prussian skirmishers mixed in. Paul and I painted 2 companies each but I can barely tell the difference. A close-up of the colours, I'm rather proud of those. 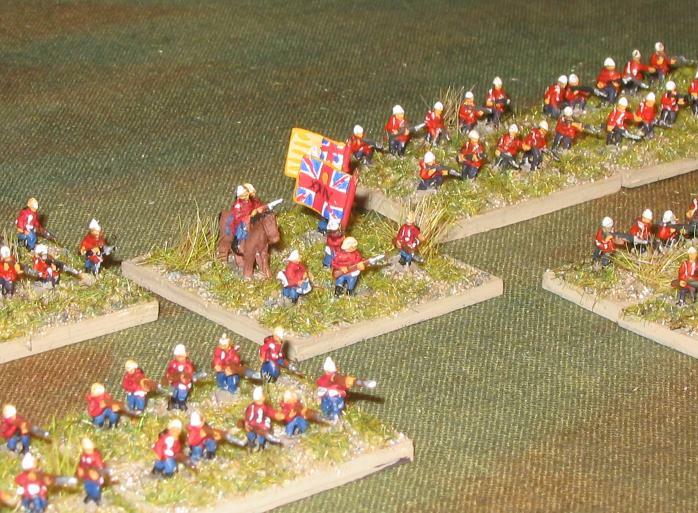 The mounted are FPW Dragoons and the dismounted FPW skirmishers. 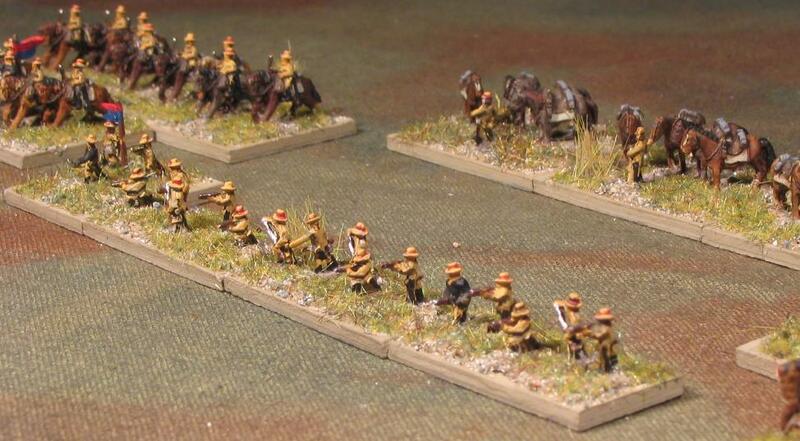 The horseholders are from the ACW range. These are ACW Confederate cavalry, mounted and dismounted. As a first step in adding the support troops I have done some Heliograph parties. I still find it difficult to accept that, even after painting 12 packs (600 figures), it still doesn't seem quite enough. These are from Irregular and the only Zulus I could find that had firearms.